In my day job, if I were to get hit by a truck while scootering to the office, the other person on my team would likely get my “Lead” role by default. Good for him. Bad for me. I’ve been wearing more safety gear lately just in case no matter how hot it is. In baseball, injuries both break and make careers in an odd yin and yang sort of way. No one wants to cheer an injury with the knowledge the only reason a player is “in the show” is because somebody else got hurt. The mere fact of it guiltily steals a little of the natural joy and elation brought by promotion. Remember when Jesus Flores was a promising young everyday catcher? He was one of my favorite players and I was crushed when his shoulder injury sidelined him from play. And then sidelined him again. And again. While he underwent surgeries and rehab, another promising young catcher, Wilson Ramos, replaced him by necessity and largely lived up to the duties required of him. He became a beloved player too. As time went on without Flores in the starting role, it became clear Wilson had earned retention of that position. Good for Ramos, not so good for Flores, who became the default backup catcher. I still felt Flores deserved a starting position and while I’d hate to see him go, hoped maybe he’d be traded to a team who would use him in that role after he worked so hard to return. Yet with the twist of a knee, now Ramos is out and Flores is in the every day role. The injury is crushing for Ramos. Will he return to the starting role next season? Or will the seesaw now stay tipped in Flores’ favor long-term now? Injuries are harbingers of tragedy and triumph, but triumph without elation. With the rash of injuries so far this season, a groundswell of fans (including me) have been clamoring for Davey to play the kids over bench players on a regular basis. This isn’t to discount the regulars like Werth, but more in response to putting a young guy in as opposed to say, Xavier Nady. Welcome Bryce Harper and Tyler Moore to the show! While it’s exciting to get a chance to see the up and comers play, Werth’s broken wrist was disastrous. Yin. Yang. Then there was the one kid who came up to play backup catcher, but poor Sandy Leon ended up experiencing both the elation of promotion and devastation of injury on the same day. During his MLB debut, Leon sprained his ankle in a collision at the plate. Injuries have been a major part of the game forever, although the Nats seem particularly affected this year (and every other year, but really moreso this year). Yes, the beat goes on and the games much continue. It’s such a shame that the eagerness of seeing a prospect make his debut, not to mention said prospect’s own joy at promotion is tampered by the fact that someone got hurt to afford the opportunity. 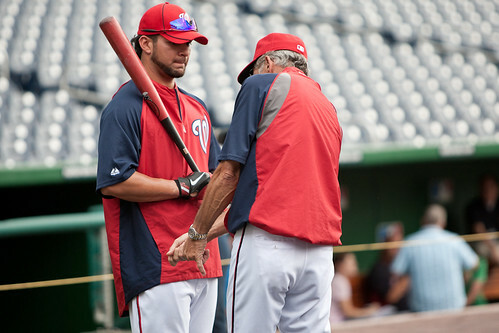 This entry was posted on Sunday, May 20th, 2012 at 2:15 pm and is filed under Injuries, Players, Washington Nationals. You can follow any responses to this entry through the RSS 2.0 feed. Both comments and pings are currently closed.